The first step in any ilastik workflow is to load the data into the project. ilastik supports importing data in various formats, from a single file or a stack of files which form a new dimension. After creating a new project, you will be presented with the main ilastik window. The left panel of this window is populated with steps of the workflow and the overlay selection box. 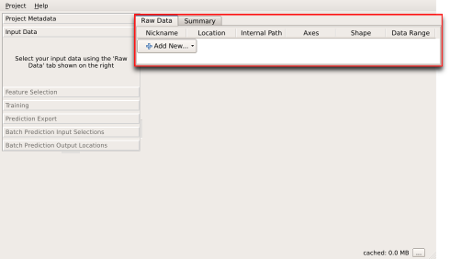 The right panel contains different data views based on the active workflow step selected on the left. Data can be added to a project in the “Input Data” step visible on the left panel. When this step is active, the data selection box on the right panel can be used to import new data files or modify properties of selected files. These can be used to load a 2D/3D/4D image from a single file or load a single 2D/3D/4D image from a stack of 2D images respectively. Some workflows require matching datasets that correspond to an input. For example, the object classification from prediction maps workflow needs a separate file to specify the background pixels in the input data. In this case, tabs visible at the top of the data selection box can be used to import additional data corresponding to an input. You can use the “Add separate image(s)…” option to add new data files to a project. 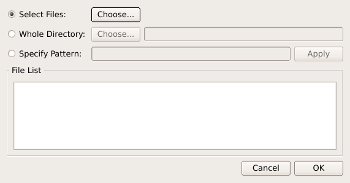 This will present a standard file open dialog, where the desired input file can be selected. This dialog also allows selecting multiple files. Note that multiple files will be added as if the dialog was used once for each of these. See the following section for instructions on how to interpret multiple files as a new dimension in the data. If one dimension of the data is separated into different files, such as a stack of 2D images to form a 3D image or a sequence of 2D images for each frame in a movie, this option can be used to form a new dimension based on a list of files. A special case are image stacks saved in multiple .h5 files (HDF5, see paragraph Supported File Formats). HDF5 supports saving multiple datasets encapsulated in a single file which can be accessed using internal paths, similar to paths in a file system. For instance, you could have a folder with multiple files, file_001.h5, file_002.h5, ..., containing data that can be composed into a single image volume. In order to assemble the images an internal path to the image data in each file has to be specified. Ilastik assumes that data with similar internal paths should be stacked and will try to determine a common internal path in the selected .h5 files. In case of multiple common internal paths the user is asked to select the appropriate one. So, if the image data is found in file_*.h5/data/imagedata in each of the files, ilastik will automatically choose data/imagedata. In case of multiple datasets per file, e.g. the files might contain data collected from multiple subjects at internal paths like file_*.h5/images/subject1, file_*.h5/images/subject2, ..., ilastik will ask which of those sub-images should be selected for stacking. Once a selection has been made, the File List box can be used to review the names of the files that will be imported as an image stack. The main file format used by ilastik is HDF5. Files with extensions h5, hdf5, ilp (ilastik project files) will be recognized as HDF5. can be imported directly into a project, as well as NumPy binary array files with extension npy. You can review and/or change the way ilastik interprets your dataset using the Dataset Properties Editor. For example, to specify that a stack of images should be interpreted as having a t-axis (for time) instead of a z-axis, use this editor. To open the editor, double-click an item in the dataset list or right-click the item and select “Edit Properties”. Read on for a description of each field in this window. Data type: data type used to interpret the binary data in the file. This is selected automatically based on the file type. Axes: Axes tags indicating how each dimension should be interpreted. The letters t and c correspond to time and color dimensions respectively. ilastik differentiates 2D + time data from 3D data, computing temporal features for the former. Marking a dimension as time changes ilastik behavior. Range: If you know your data’s minimum and maximum pixel values, you can use this field to help ilastik interpret and display your data. Normalize: If you would like your data to be displayed with a contrast adjustment using the minimum and maximum pixel values, set this to ‘True’. Internal Dataset Name: Several volumes may exist within a single HDF5 file. Use this field to choose which internal volume ilastik should load from your file. Storage: Specifies how ilastik should locate your data the next time your project is opened. Absolute Link: Your data always resides in the same place on disk, even if you moved your project file since it was last opened. Relative Link: Your data is in the same parent directory tree as your project file. You may move your project file and data files simultaneously, but their relative locations must be fixed. Copied to Project File: If you select this, your data will be copied to the project file the next time your project is saved. Pro: Your project file will always be valid, even if you move your data. Con: This creates a copy of your data. Channel Display: If your raw data has multiple channels, use this setting to tell ilastik whether it should be displayed as a composite RGB image or as separate grayscale channels.